Leading edge monarch in Spring 2011, north Erath County, Texas. Earlier this week on the first full day of Spring 2011, I received a communication from Journey North that the monarchs “were pouring out of Mexico” and that the leading edges were entering Oklahoma, about a 100 miles from our place in north Erath County, Texas. A day before the e-mail, I had seen a monarch in our front field feasting on nectar of wild verbena, but I did not have my camera to take a picture. The next day, March 23, 2011, I spotted this leading edge monarch in our live oak tree out in front of our house. Twenty-three live oak trees live on the knoll of our home, a hill really, that is known as Poprock Hill in local folklore. These trees have been the roosting place for monarchs, I am sure, for several generations. We have seen monarchs every year since we have moved here and last year I snapped pictures for the blog of a large roost of monarchs in the Fall as they flew to Mexico. I have known of butterflies all of my life, but only in the last fifteen years have I begun to look deeply into the ecology of where I live in north Erath County, Texas. This blog I write, Sage to Meadow, has become a platform for me to the rest of the world, a medium of communicating my love of nature, its greens and browns, births and deaths that encompass us all. Butterflies such as the monarch abound where I live and I did not know milkweed was a prime source of its nutrition. Milkweed, like many other things, is an example of nature’s complexity and diversity, for although it is a prime source of food for butterflies, its over-indulgence by horses and cattle is toxic and may result in death if untreated. When I learned of that last year, I quickly researched the milkweed and its correlation with horses and found that adequate grass and grain prevents the livestock from consuming large quantities of milkweed. So, the lesson here is balance for farmers and ranchers. Keep good stands of grass in the field, do not overgraze, and horses and man and butterflies can co-exist. 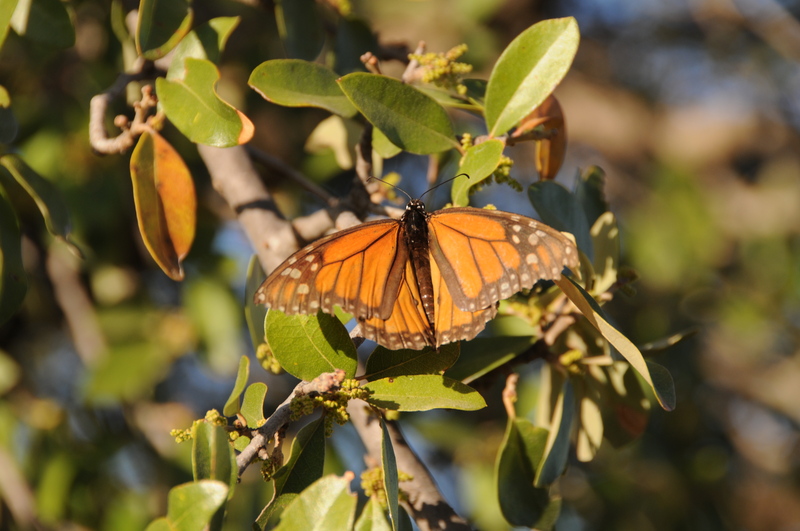 It’s not the final lesson of life, but it’s one of the best lessons to acquire — for the monarchs can continue to find food to and from Mexico, horses will graze elsewhere and be pacified, and we will be able to look upon all their beauty and grace as we observe from close and far away the interconnectedness of us all. Green-flowered Milkweed (Asclepias asperula), May 2010, north Erath County, Texas. This is a great post about the balance of nature and how, with knowledge, we can fit into it. I applaud you for it! I have never seen a Monarch in this specific area although we do have some (but not a lot) milkweed and I have known that it is a favorite of butterflies. Since we have to face pain and death regardless of how careful we are, achieving or working towards a balance seems the behavior we need. The milkweed plant is absolutely odd in the field of grass. Butterflies are all over the plant and it has such a striking morphology as you can tell from the photo. If you read my reply, do you have any photos of the milkweed from where you live? 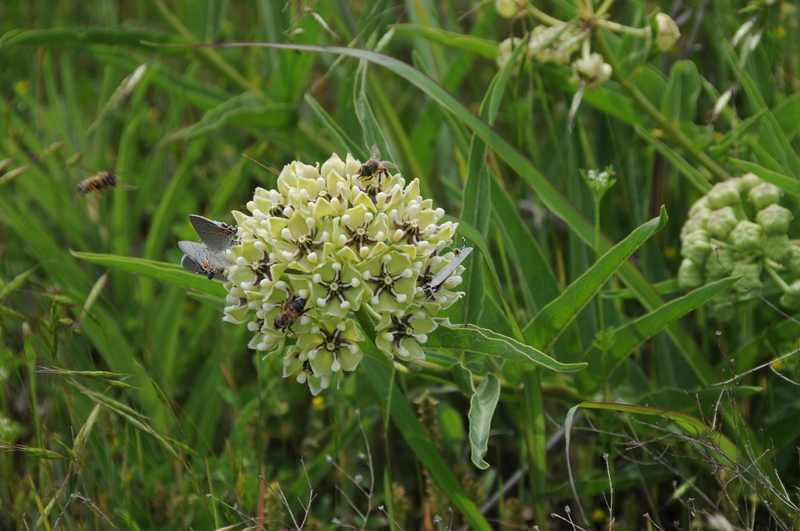 Yes, the HTML worked and I got to your Flickr site to see the milkweed. Really interesting and colorful. Somewhat purpleish, blueish, as compared to the ones in my field. I knew that milkweed played an important part in the life cycle of Monarch butterflies… but I did not know that livestock could sicken and die if they consumed too much of it. Lovely image to go along with this post! Thank you, it is a lovely image and I did not know there were so many butterflies and bees about the plant when I took the shot last year. Lovely to see the monarch! They are one of the things I miss most about America. They truly are beautiful creatures. I hope my pictures give you pleasant memories, but I know you must miss seeing them in person. We have whole fields of milkweed here in New England. It is toward the northern end of the Monarch migration. The only reason we have large quantities of this plant is because most all of the farms have failed. Areas that are in second stage plant succession hold milkweed as the areas are not grazed or mowed. I have wondered if the monarch population has increased because of the loss of agriculture, but I think not given it is alive and well and still going strong in most parts of the country. A terrific, thought provoking post Jack. Thanks. So sorry to hear of failed farms. We are going through a crisis down here in Erath County of diary farms that are going under to big agribusinesses. A couple of suicides and other messy things are happening. A lot of farmers and ranchers around here shred or mow fields for a variety of reasons and in so doing are able to grow crops, but also shred native grasses and flowers that reduce or eliminate nutrition for other sentient beings. Complex — to say the least. Thank you for this, Jack. I’m fascinated to learn the Latin name for Milkweed is Asclepias which was the name of the legendary Greek physician some think of as the father of medicine. Interesting that Linnaeus thought of it as such source of healing he would name it after the ancient figure. I think I’ll plan to plant some in a sunny spot (given I don’t need to worry about horses or cattle on my little plot of ground) and keep my eye out for the Monarchs. It may bring healing in unexpected ways. Wow, what a fact about Asclepias. I did not know that. I hope you can plant some milkweed and enjoy its visitors. It does have healing properties, just like the words on your blog. How heartened I am to read that the Monarchs have taken wing! I know you had some pretty frigid weather down there this past winter that reached well into Mexico. I worried for the butterflies who winter there, wondered how they’d fare. I am looking forward to raising a brood or two this summer and fall, as we did last year. Thanks, Jack. Hi Marie: Raising a brood — I like that phrase. We did have cold, cold weather in Texas. Mexico was a little warmer, so I have heard. We are not going across the border much anymore. Leave that to the Monarchs. Jack, I thought about your return-to-nature project the other night when the evening news show a clip of the Monarchs leaving Mexico. It’s the largest movement in YEARS. They’re back, yay! And, yes, about the milkweed; that was on a nature program last year. I planted a bit in my patch of garden. Unfortunately, too many farmers/ranchers have gotten rid of the plant for the reasons you mentioned. I think small areas can be partitioned and replanted out of harm’s way. Your blog is a beacon for all those who want to live in harmony with Nature. Kittie, I think some milkweed is really good for the overall balance in nature. That you planted some is most enlightened. I know the butterflies will flock to you. Thank you for your last sentence. Hope all is improving with your family. These are very lovely pictures, Jack! What are the little gray butterflies on the milkweed called? I don’t know, Erin. I’ve been meaning to look them up and will do so. Hope all is well and the weekend goes well for you.